Cairt shawin the Port Stanley area. 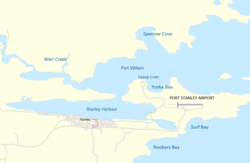 Stanley (/ˈstænli/; an aa kent as Port Stanley) is the caipital o the Falkland Islands. ↑ "Headline results of 2012 Falkland Islands Census released". Falkland Islands Government. Retrieved 23 October 2014.